A lottery greeting postcard card from Fengcheng, Jiangxi Province (江西省 丰城). 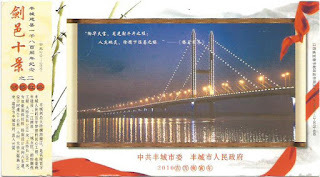 It shows the Jianyi Bridge (剑邑大桥) across Gan River (赣江). This bridge manages to bring closer to the city dwellers across the river. Thanks Baicai. This postal card comes with an 80 Fen imprint stamp on Year of the Tiger. Several stamps were used to up-rate it; a 60 Fen environmental definitive and three different 1.20 Yuan stamps which are petroleum drilling (2013-2, 3-1), and two different vase stamps (2013-9, 6-3 & 6-5). They were cancelled at Jiangxi Fengcheng Xinchengqu 1 (江西 丰城 新城区1) on 27.2.2018.